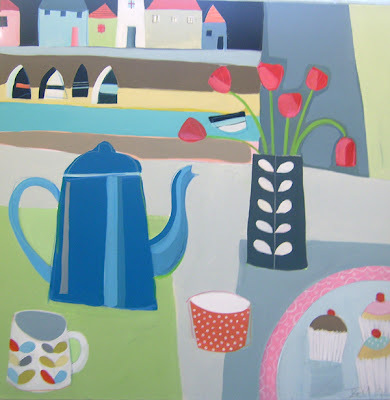 Its a new week, and a new painting featuring my favourite Orla mug and more cakes!!!! We just got back from a very inspiring walk along the beach. I was looking for a few nice pebbles to display some jewellery on in my new cabinet. The light was spectacular, we both glowed orange. I always forget my camera though. What is it with this weather?? We've had blue skies nearly every day of February. Global warming?!?!?! You have lovely illustrations and great pictures in your blog. I'll come round more often. the splash of color was perhaps just a visual gift for you... when it turns all pink in the sky here at the end of the day, i always think if "falling in love" or love. your painting is full of dance and delight. Love your new painting! Love your colours as always! The sky was burning here tonight. No camera. Oh that's a lovely painting! Your new work is great! I have a set of those mugs!! They're fab aren't they?! I've been loving the weather recently. Everyone seems so much more smiley and happy when the sun is shining.